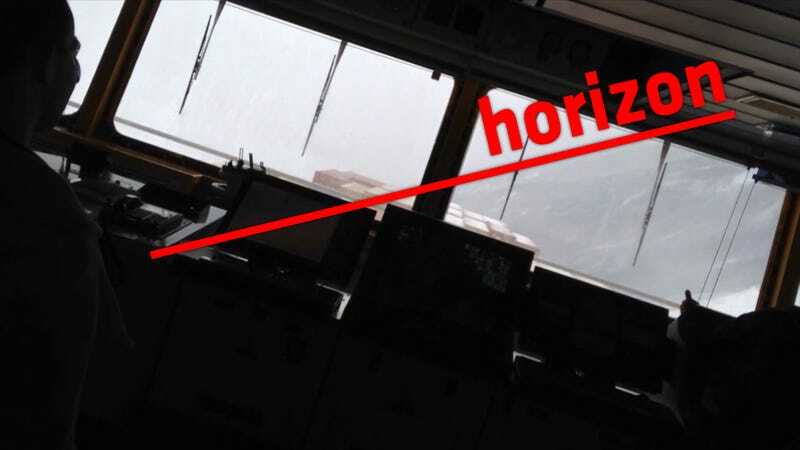 This is what winter storm Hercules looks like from a 2,992 TEU container ship out in the North Atlantic. It's also what more than 40 degrees of rolling looks like from an 800 foot long ship. This is OOCL Belgium on January 3rd. As the website gCaptain explains, these rolls are the result of waves possibly 20 meters (65 feet) high. What does that feel like on the ship? Those are the type of rolls where you look out the port or starboard bridge wing and see nothing but the waves directly next to the ship, and then the next moment, all you see is sky while you try to hang on to something. So while Hercules may be flooding your town in England or turning your city into ice in the Northeast, be thankful you're not out on the high seas. Oh, and how much further could this container ship have rolled without tipping over? gCaptain points out that Typhoon Cobra sunk number of American ships in WWII with 70 degree rolls. The OOCL Belgium is currently in Liverpool being inspected for cracks.